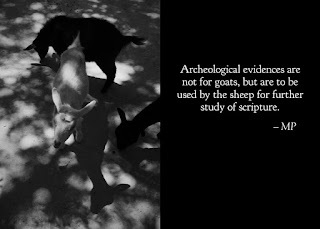 Here is the answer that I gave: "Yes, there are archeological evidences for the history of Christianity, you can look these up in a Christian History Book, Bible Dictionary, or Bible Handbook, but none of these are going to convince an unbeliever. The apostle Paul said that the gospel is the power of God for salvation1 and faith comes from hearing and hearing by the word of Christ;2 therefore, we must preach the gospel. Jesus told His disciples: "When the Helper comes, whom I will send to you from the Father, that is the Spirit of truth who proceeds from the Father, He will testify about Me, and you will testify also, because you have been with Me from the beginning. "3 In order for someone to come to faith in Christ they need both the inward testimony of the Spirit and the outward testimony of the apostles.4 During Christ ministry He did many mighty miracles that no man had ever done, yet many Jews saw these signs and did not believe.5 No one can come to Jesus Christ unless the Father draws him. Every one who has heard and learned from the Father will come to faith in Jesus Christ.6 All you and I can do is preach the gospel. Therefore, preach the gospel and pray that God’s will be done." 4 The apostles testimony is located in the New Testament Gospels and Epistles. 5 cf. John 10:25-26 & 12:37.